The Solar Decathlon is a biennial event hosted by the U.S. Department of Energy. It challenges college students from around the world to design and construct a solar-powered house and compete against other schools doing the same. The 2017 competition took place in Denver, Colorado. sustainNU staff member Audrey Steinbach traveled to Denver with the Northwestern team, House by Northwestern (HBN), and shared this account of her experience. Learn more about Northwestern’s entry at www.northwestern.house. The 11 teams competing in the Solar Decathlon, including the Northwestern team, built their solar-powered houses on their home campuses, deconstructed them, shipped them to Denver, and then reassembled them. I arrived at the Solar Decathlon after all the teams had finished reconstructing their homes in the Solar Village. At first, I could not believe that all of the houses in the village were designed by students, each one remarkable in its way. There was a water-smart house from UC Davis, a home with a fully operational hydroponics system inside from the University of Maryland, and a farmhouse from Missouri University of Science and Technology. These were just some of the houses that Enable, Northwestern’s entry, was up against in this two-week long competition. My job was to help lead tours of Enable. At first, I was nervous, but after my first tour, I realized that I was so proud of this project that sharing my excitement with visitors came naturally. It was sunny and dry the first few days that the competition was open to the public – perfect weather for Enable’s solar panels to do their thing. The weekend flew by with thousands of people visiting the Solar Village and touring our house. It snowed on Monday, October 9. This weather brought with it a slightly ominous feeling, as the most critical scores were coming up in the days following this blip in otherwise perfect weather. With the snow at the beginning of the week, and the Village closed to the public on Tuesday and Wednesday, there wasn’t much for a tour guide to do but wait. The team received their first score for architecture. It was a bit lower than they had hoped for, but they did not seem disappointed. Everyone kept on working hard, knowing there were more contests and scores ahead. Although the air had slightly changed knowing that the competition was extremely stiff, the House by Northwestern (HBN) team was confident in Enable and its ingenuity. After a few days off from showcasing the ultra-efficient and aesthetically pleasing features of Enable to the public, I returned to the Solar Village. The snow had melted, and the bright Denver sun had returned. When I got to the house, everyone was gathered together in the living room; an unusual start to the day. As I walked in, I realized that I had interrupted Maggie Waldron, director of program operations, partnerships, and communications for HBN, during an important announcement. They told me to check out the countertop, which I had spent the last week telling strangers was made of 100 percent recycled glass. On the countertop sat the first place prize for communications for Enable and the HBN team. It seems that I was the last one to hear the news and I was ecstatic for the team and their hard work. In the days that followed the sun continued to shine and Enable went on to win first place in market potential, no surprise to me as most everyone that I had given a tour of the house told me that they wanted to live in it. The team also took third place for engineering, a testament to the hard work and brilliance of our promising McCormick engineers. As my time in Denver was coming to a close, I found myself not wanting to leave the company of the team. They had welcomed me into the fold as if I had been there since the very first days of the project and had taught me so much in just ten days. Alas, I said my goodbyes and headed to the airport knowing how lucky I was to work with such a passionate team. The most humbling part of the Solar Decathlon was not the awards Northwestern took home, but rather the comradery of the students and their passion for cutting-edge solutions to the world’s problems. 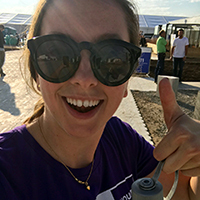 The unrelenting teamwork that the House by Northwestern team showed and the vision of uncompromising sustainability that Enable brought to this year’s Solar Decathlon was remarkable. Overall, it made for an unforgettable experience. Congratulations to the HBN team on their success and as always, go ‘Cats!